Chef proprietor of Haveli Indian restaurant in Douglas, Cork. The only Authentic Indian chef in Cork? Gerald was born and raised in North West India in the province of Rajasthan. From a very early age he developed a passion for cooking under the guidance and influence of his mother. In 1983 Gerald moved to New Delhi to develop his skills and knowledge in the wide varieties of Indian food at the highest level. Gerald trained and worked for over 10 years under renowned Indian chefs, Sr. Master chef M. Imtiaz Qureshi, Master chef M.Naseem and late master chef of Bukhara Madan Lal Jaiswal. Keen to learn more and broaden his knowledge Gerald travelled and worked in New Zealand and Europe, eventually moving to Ireland in 1999. Of great disappointment to Gerald was the lack of authentic Indian cuisine that reflected the fantastic regional variety found in India. Most of the so called Indian restaurants were serving half Indian half European dishes, lacking in the true flavours for which Gerald had developed a passion. As a result Gerald and his wife Majella established Haveli in 2006 with the aim of bringing fresh, genuine and authentic regional Indian cuisine to Cork, making best use of the outstanding natural ingredients available in Munster. 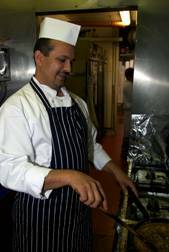 Gerald insists on only the finest quality locally sourced ingredients to produce beautiful mouth watering dishes. There are no additives, artificial colours or preservatives used. Flavour is developed through a variety of cooking techniques and herbs and spices. Unlike many other not so authentic Indian dishes heat is not compulsory as it often masks flavour and customers have a wide choice of heat free, gently flavoured authentic Indian dishes. Marinades and herbs produce beautiful fresh meats cooked on live charcoal in an authentic clay oven. Vegetarians have a wide variety of choice as much Indian cuisine is in fact meat and dairy free, and fresh fish when available is also used to great effect. All of Gerald’s dishes are gluten free and he takes pride in being able to cater for any customer with specific dietary needs.